Our 2017 San Francisco Shark Season is coming to an end soon. We’re currently sold out except for a few cage spots on our Saturday, November 4th expedition. Trips depart from San Francisco’s Pier 40, near AT&T Park. 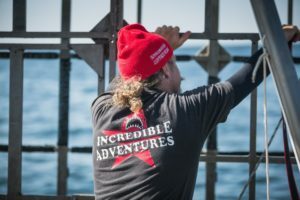 The cost is $825 per person and includes use of a wetsuit, dive training, white shark naturalist presentation and meals aboard our shark boat.